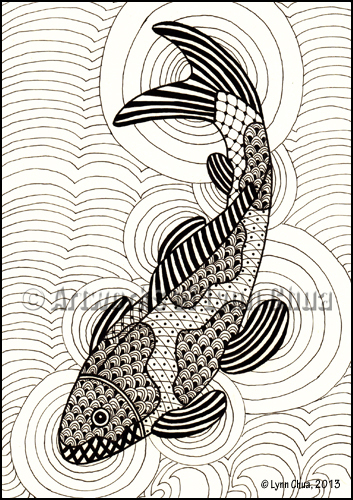 Zentangle� inspired art. 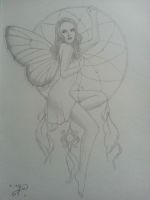 A5 Copic liner on Fabriano cream sketch paper. Colour can be added on request from buyer. Watermark and border will not be on original or prints. Mayumi Ogihara says: Amazing details!! ~ Reply? Erich Heidewald says: That is neat! ~ Reply? Mitzi Sato-Wiuff says: Ahh, it's so nice to see a KOI! A lot of people can't tell the difference of koi from fancy goldfish (to me, they don't look anything alike), and it bugs me since I'm really into goldfish or Asian freshwater fish in general. This is so cool with all the different patterns. I really like it! ~ Reply?